Poets know that April is National Poetry Month. This is a time when we all want to do a lot of reading and writing. We also want to attend readings and participate in poetry conversations, but sometimes distance makes that difficult or impossible. Not really! Not any longer! Some of our clever poet bloggers have come up with creative ways to spread the word without leaving home. Dave Bonta and Kristin Berkey-Abbott have invented the Poetry Month Book Club. Dave had already planned to read and review one book per day (yow), but Kristin suggested that together they agree on four titles, one per week, for mutual reading and blogging. Dave explains the procedure HERE and Kristin explains the procedure HERE. While you're at Kristin's blog, be sure to order her chapbook, I Stand Here Shredding Documents. But that's not all. Dave and Kristin are also inviting other poets, bloggers, and poet fans to join the discussions by posting comments and questions at the blogs. Using Dave's tech skills, they will do a podcast interview with each of the four poets. The podcasts will be available at Dave's site, Via Negativa, and will be available for download. It would be nice if you could obtain and read each book prior to its discussion. If you can't get the books, perhaps you could google the poets and read a handful of poems by each. To make it easy and enticing for you to order books and become familiar with the titles, Dave has linked to each poet's publisher, the book's Amazon page, and one online review. Find that information HERE. Please join Dave and Kristin in reading these four titles. Join the fun and send in some questions for the interviews and leave some comments at the blogs. This past Wednesday I had a wonderful experience. First, I should mention that I have a daughter who works for NY Life in Parsippany, NJ. 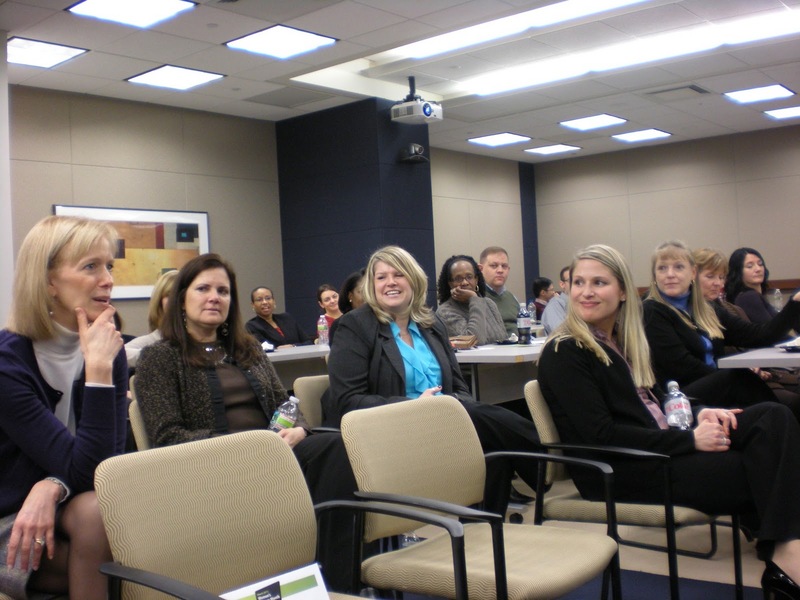 Back in 2008 the Human Resources person, Christine Birnbaum, initiated a number of programs to empower women in the workplace. 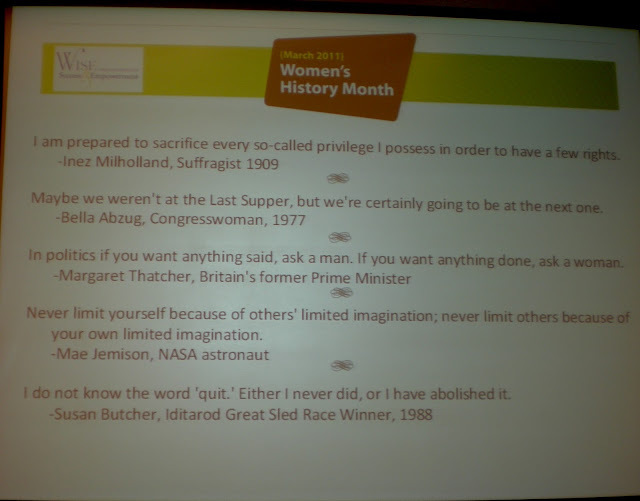 A few special programs were scheduled for March, Women's History Month. 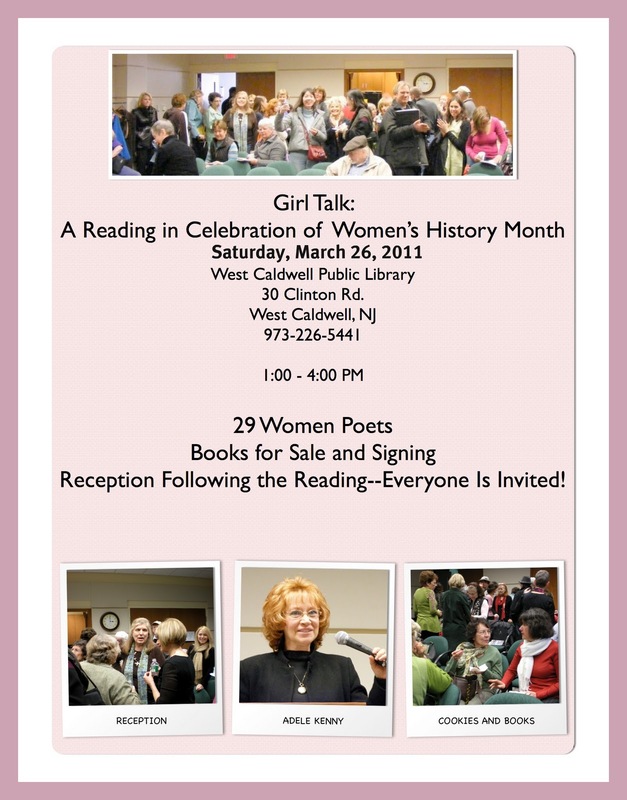 I was invited to give a reading of poems related to the lives of women. It was a wonderful experience and a real thrill to bring poetry into a place where it isn't usually found. Each year since then the program has grown. This year's program had a theme: "Our history is our strength." Several weeks ago, Gail Collins, author of When Everything Changed: The Amazing Journey of American Women from 1960 to the Present, spoke to a packed room and to other offices via satellite. She was followed by Julie Johnson, co-author of The Female Vision: Women's Real Power at Work, who spoke about women in the workforce. This week's program was the "Live Collage." Several months ago my daughter volunteered to be on the committee designing a program for the month. She suggested asking a handful of women to each speak about a woman she admired; together they would form a collage of women and voices. The committee loved the idea and decided to use it. (And then they made my daughter head of the committee!) Because I'd been at the first year's session, they decided to invite me in to read a poem about a woman. When I was there in 2008, I think there were about 20 people. This year there were over 70! In fact, there was a waiting list. Two screens were set up at the front of the room and power point slides were projected onto them. The one you see below lists inspirational quotations from important women. I took this picture as the room was filling. Those empty chairs were soon filled. That's my daughter in the front row. And yes, there are some guys at the back of the room. Once everyone had arrived, Christine gave a wonderful introduction to the event. And then she gave me a lovely welcome and introduction and called me up. 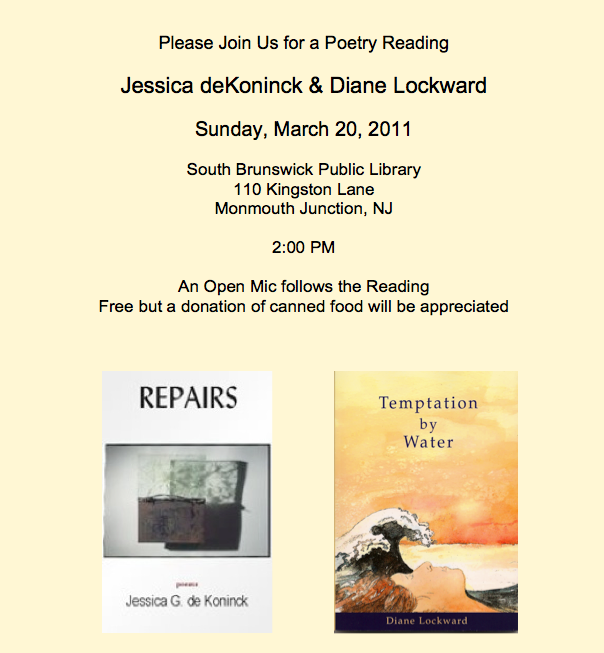 I'd chosen to read my poem, "Eve Argues Against Perfection." I spoke briefly about my feeling that Eve had taken a bum rap for the Fall of Man and that my purpose in writing about her was to have her proclaim the Rise of Woman. Prior to everyone's arrival, my daughter had put an oversized postcard on each chair. Half of the cards had my poem, "The Fruitful Woman," and the other half had my poem, "Pyromania." So everyone went home with a poem gift. Painting displayed during my part of the program. And then one by one the six speakers went to the podium. As each woman spoke, a slide of her admired woman appeared on the screen. 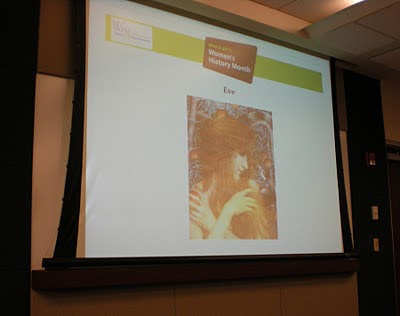 We heard about Barbara Smith, the opera singer; Maya Angelou, the author; Mary Edwards Walker, a suffragist, physician, and military woman; Dr. Virginia Apgar, the physician who developed the Apgar scale; and Frances Beinecke, an environmental activist and president of the National Resource Development Center. There was one name not familiar to us—Lisa Crilly, a physical therapist who works with special needs children, one of whom is the speaker's daughter who was born with cerebral palsy. Lisa works with the daughter and also helps the mother cope with the challenges of raising a special needs child. She has assured this woman that her daughter "will reach her stars, wherever they are." The presentations were just fantastic. I learned a lot and was several times brought to the verge of tears. Making the event even nicer was a lovely assortment of sandwiches and cookies. Also, a gift of a mug was given to each presenter, me included. One more thing that made me very happy was finding out that similar Live Collages had taken place in the NYC office, the Westwood office, and an office in Massachusetts. 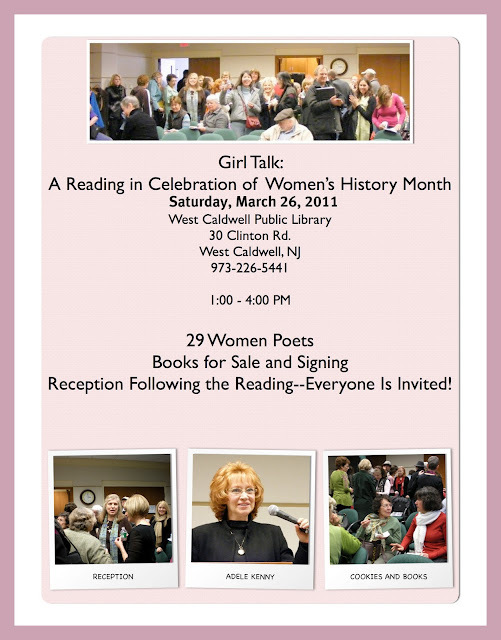 What a nice way to celebrate Women's History Month and make way for National Poetry Month. Visit The Patch for an article about the event. Edward Hirsch has an essay, "'My Pace Provokes My Thoughts’: Poetry and Walking,” in the March / April American Poetry Review. This immediately captured my interest as I, too, am a poet who walks. 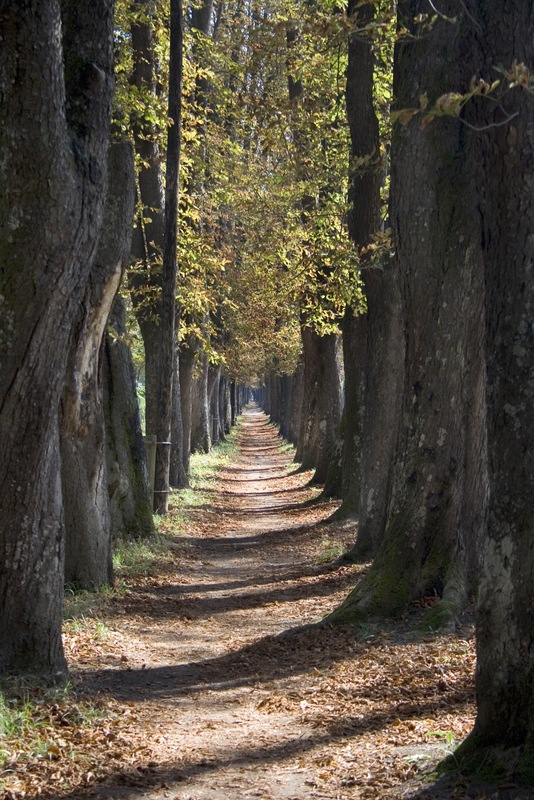 I began regular walking about 20 years ago, initially because I needed a way to relax, to get out of my own head. I immediately found that walking, even just 30 minutes, energized me and boosted my spirits. I felt more fit. I slept better. I became jollier. Walking has become a regular practice when the weather permits. Sometimes in winter I find myself longing, almost aching for warm weather so I can get out walking again. I felt that intensely throughout this year's long, hard winter. My practice now is to go with an ipod and listen to music. It perks me up, and it fills my head with words, music, images. I pay attention when I'm walking in a way I don't when I'm driving by. I say hello to other walkers and sometimes exchange a few words. Walking is both solitary and civilized. It stimulates my thoughts and, as Hirsch argues and documents, it fuels the creation of poetry. “Poetry is a vocation. It is not a career but a calling. For as long as I can remember I have associated that calling, my life’s work, with walking. 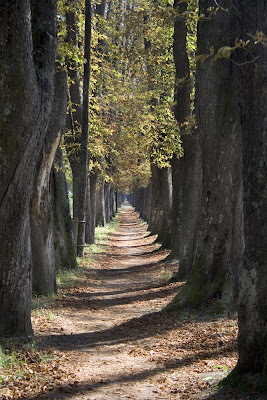 I love the leisurely amplitude, the spaciousness, of taking a walk, of heading somewhere, anywhere, on foot. I love the sheer adventure of it, setting out and taking off. You cross a threshold and you’re on your way. Time is suspended. Writing poetry is such an intense experience that it helps to start the process in a casual or wayward frame of mind. Poetry is written from the body as well as the mind, and the rhythm and pace of a walk—the physical activity—can get you going and keep you grounded. It’s a kind of light meditation. Daydreaming is one of the key sources of poetry—a poem often starts as a daydream that finds its way into language—and walking seems to bring a different sort of alertness, an associative kind of thinking, a drifting state of mind. The next time you go walking, make a mental note of some of the things you see. Let them be random. After you get home, see if you can work them into a poem. You might use Collins' ambling method as your model, going from beginning to end. I'm happy to say that spring is almost here, warm days have been hinted at, buds are on trees. Let the walking begin! A few months ago poet, teacher, and blogger Martha Silano let me know that three of her students were doing their class poetry project on my poem "Linguini." This would take place at Bellevue College in Washington, obviously much too far away for me to be there. But several weeks later Martha sent me the Power Point project they'd created. I knew immediately that I wanted to transform their work into a video. I wanted to use Garrison Keillor's reading of the poem as the soundtrack, but when I added the project to iMovie, it went so fast that the reading could not keep pace. Even though Keillor reads the poem fast (I suppose to keep to his time limit), the power point went much faster. I had to somehow slow it down. So I figured out how to save it as slides. I then turned those into jpegs and added them into a movie project. Then I dragged in the sound track and spent a ridiculous amount of time coordinating the reading with the slides. But I finally got it. So with a huge shout-out of gratitude to Martha and her fabulous students, here's the result. I've had a lovely surprise, a surprise, though, only because my memory failed me. Many moons ago my publisher forwarded to me a request for permission to reprint my poem, "Blueberry." The request came from painter Judith Greenwald who was planning an exhibit of the paintings she'd done under the influence of poems. Each painting was to be paired with its poem. Of course, we said yes. And then I forgot all about it. Then last week poet Alice B. Fogel sent me a note saying that she'd read something from the book to a group of people and discovered that my poem was in the book. Book? What book? Alice described the book and the project and the dim bulb of memory snapped on. I went into my old mail and discovered the original note from Judith. Alice put me in touch with Judith. I asked if there were any books left. Yes! And now one is in my hands. Poem: a conversation between painting and poetry is absolutely gorgeous. All the paintings are reproduced in glorious color. Paintings are on right pages, poems on left. And what an august group of poets: Rainer Maria Rilke, Li-Young Lee, Jane Hirshfield, Alice B. Fogel, Mark Strand, Stanley Kunitz, Wislawa Szymborska, William Stafford, Naomi Shihab Nye, Denise Levertov, and more. Poems have been variously described as soul-making, life-cherishing and lifesaving. They have been referred to as gifts, surprises, prayers and challenges. They have been seen as providing intimacy, comfort, pleasure, discovery, rebirth, arousal, magic, music and connection. Each painting in this show has been inspired by a poem. Whatever the communication has been, I have received it in my own way, taken it in, tasted and ingested it. I have read each poem time and again, both silently and aloud, heard its melodious sounds, felt its powerful rhythms. I have gone back to certain phrases and read them yet again. From this, an image has formed, perhaps consciously, more likely not. It may be just a color, perhaps a shape, or even a texture. I live with the poem for awhile and let it work on my unconscious. I meditate on it. I make it my own. Once I commit a mark to the surface, the painting/poem has a life of its own. I go back and forth to the poem yet it remains well in the background as this continued creation is driven by its own forces, its own need for meaning and expression. The completed piece has some relationship to the original poem which sparked it, yet it has its own integrity. Then I offer it to you, my audience, to take the act of creation a step further, to see what you see, to let what's implicit in you take form, to let your own meanings arise and develop. These paintings and the poems that preceded them are co-creations. Each of us—the author, the painter, the audience—with every moment of engagement, is giving birth to some part of ourselves over and over. 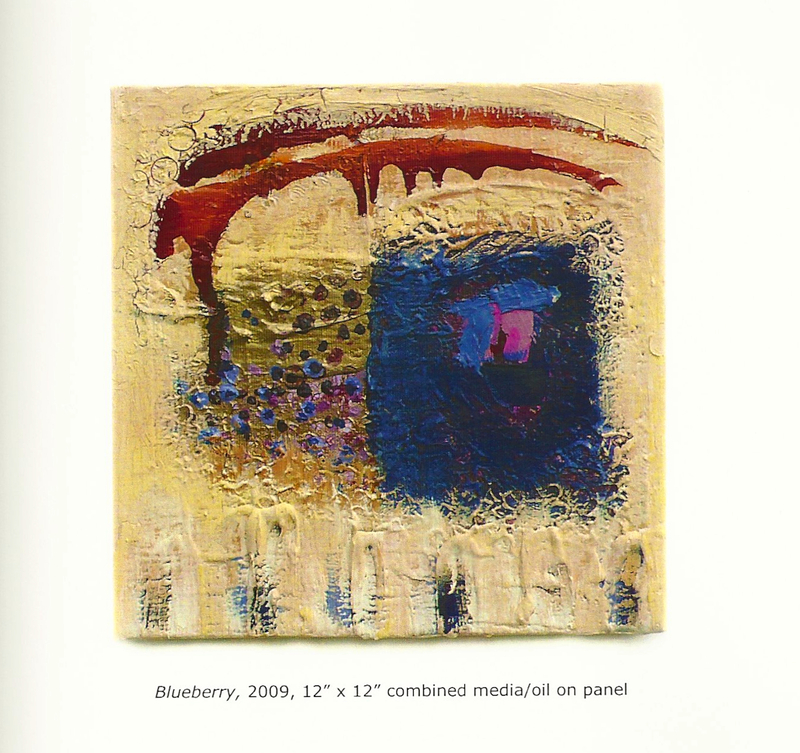 The paintings, then, represent a conversation or dialogue with the poet and her or his poem, with the canvas and the color, the texture and the form, and with you, the viewer. We all share in creating meaning and value and, ultimately, authorship in an activity which is both deeply solitary and profoundly communal. Here's the painting that Blueberry gave birth to. I love the way serendipity sometimes happens. I love knowing that my work influenced someone else's. And I love this book. Jehanne Dubrow's Stateside is a wonderful collection. This poet’s exquisite formal poetry seems especially appropriate in a collection about the traditional subject of war, a subject that, sadly, is as relevant today as it was when Homer composed his epic poems. Dubrow gives us the story of modern warfare from the perspective of a military wife left stateside during the months of her husband's deployment. These are not, however, protest poems. There's no Afghanistan, no Iraq, no president or political party under attack. We never even learn the location of the husband's deployment. 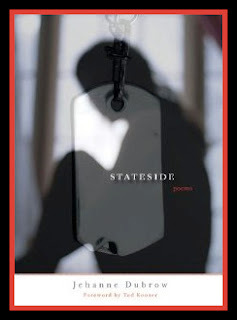 Stateside is the personal side, the woman's side of war. The collection's forty-three poems are divided into three loosely chronological sections. Part I precedes the husband's departure. The wife experiences anxiety over the coming separation and her husband's safety. Her love and fear are poignantly conveyed throughout this section. For example, in "Love in the Time of Coalition," the poet employs the language of war in a sonnet, traditionally the form for a love poem: “He whispers weapons of mass destruction / against the sand dune of her skin. She’s toxin. // She’s liquid sarin. She’s pure plutonium. / Her tracers burn and dim and burn again.” Even this couple’s love-making is shadowed by war. In "Sea Change" the speaker imagines her husband, a sailor, drowning and absorbed by the sea: ". . . salt water scrubbing sand / into my husband's skin, / his fingers pale anemones, his hands / turned coral reef, and in / his eyes the nacreous pearls of Ariel." She fears his drowning—and her inability to save him. The poems in Part II focus on Homer’s Penelope, the traditional model of a military wife left behind by her husband in time of war. But this is a Penelope transported into modern times. The speaker imagines Penelope, identifies with her, and speaks for her. She, too, must care for a son. But whereas Penelope was the model of fidelity, that virtue is something the speaker wrestles with. In "Ithaca" she is described as "a wife who tries / to guard her chastity, ties / it like a yellow ribbon to her door, // sticks it to the bumper of / her car, so that the neighbors know / she sleeps alone . . ." Ithaca is for her a metaphor: “She’s Ithaca, trapped in her own body, / an island circled by the sea.” Homer’s Penelope managed her household and spun her cloth; Dubrow’s Penelope must also deal with the details of domestic life, but these details are contemporary and often take her out of the house. She goes to the mall, gets a new hairdo, buys ice cream at the Dairy Queen, and dines at Taco Bell. and often we are miles from talking. smiling before the traffic light turns green. us in that shot by Alfred Eisenstaedt. we're cold as strangers passing on the street. Dubrow has a remarkable facility with forms. They are handled with such deftness and grace that the reader is barely aware of their presence. A close inspection reveals a number of sonnets scattered throughout the collection, other poems in blank verse, some in syllabic verse, and others in rhymed couplets and rhymed quatrains. There's even a triple triolet! William Stafford defined a poem as “an artistic arrangement of words on the page.” Dubrow displays the artist's touch in the way she formats her poems, sometimes going flush to the left margin, other times scattering the lines in a visually attractive pattern of indented lines. When she scatters lines, uses white space, and omits punctuation, it is not gratuitous but rather relevant to the subject of the poem. She uses form to convey meaning. The previously mentioned "Sea Change," for example, uses indentations that beautifully parallel the wife's shifting in and out of a dream and also suggest the changes the wife fears in her husband. Stateside is both a delicate and a forceful collection. It simultaneously pleases us the way familiar stories do and delights us with its invention and poetic skill. And it reminds us that no matter the scope, war is always personal.